Yo! 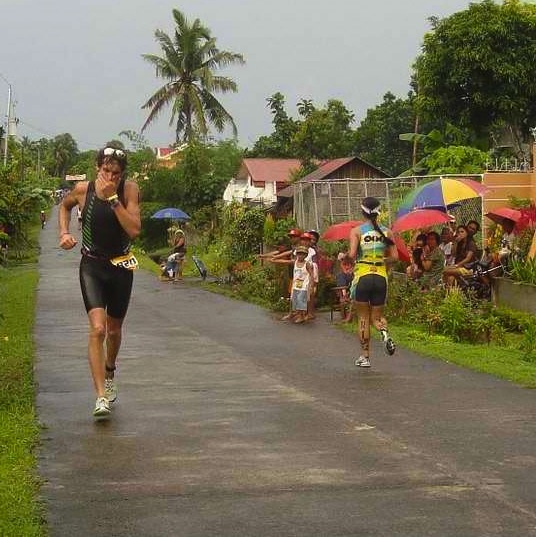 You’re about the read Part 2, the Epic (in length, anyway) Conclusion of my Philippines 70.3 race report. To get the full story (who is Jesse Beiber? ), start with Part 1. Sorry it took me so long to get this thing out, but as you can see, sooooooo much to recap. Hope you enjoy, and please let me know what you think in the comments below. Later! Breakfast of Champions, or at least, 2nd place finishers. Well, really it was a triathlon in Cam Sur, but with all the pre-race trash talking and media hype, it felt HUGE! 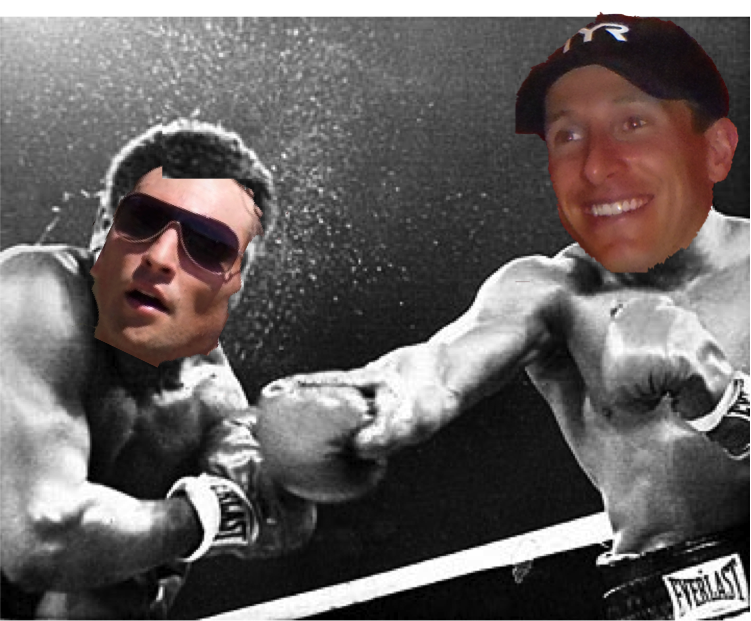 Would the defending champ take down the “young” up & comer? Here are the guys I kept my sights on 1) Pete Jacobs – defending champ, super stud swimmer, fast bike, fast runner, sounds easy to beat right?, 2) Cameron Brown – one million time Ironman champ, a legend in the sport, and 3) Lrey Villafuerte – the Governor of Cam Sur and a superb wakeboarder. The gun went off, I tried to swim behind Pete. Too fast. So I tried to swim behind Amanda Stevens (70.3 World Champ, super stud swimmer). Too fast. So I swam with Cam and the rest of the pro field. Just right. The swim was broken into two lakes, 1200 meters in one, then a short run to 700 meters in another. In the first lake, I just hung in with the group and watched the little flying helicopter film us. Only times I remember seeing flying video cameras was in NFL football games and high speed convict chases. Either way, it means you’re a big deal. On the second lake I made a little getaway with my specialty dolphin dives and opened a small gap between me and the rest of the group, coming 3rd out of the water behind Pete and Amanda. I was about 3 minutes behind Pete, and thought if I kept it to 5 minutes or so, I might have a shot at him on the run. So I rode hard, which was easy to do because the course never went more than 2 minutes without screaming/crying girls and/or a 100 person marching band. I am not joking. Ridiculous. 28 miles of mostly rural, tiny little towns and EVERYONE was out to watch the weirdos in tights and funny helmets. At the turnaround, I was jazzed to see that I’d only given up another minute or so to Pete. Yes, I just used the word jazzed. If I remember correctly, I said to myself at the turnaround, “Good riding buddy. I’m jazzed for you.” But here’s where my race started to go downhill, both literally and figuratively. I made two major mistakes: 1) Instead of staying steady, I got excited and picked up the pace. 2) I stopped drinking enough water/electrolytes. Why, you ask? Well, I’m an idiot mostly, but also it started raining monsoon style. And even though the children and marching bands could care less, I was a little freaked out going 30 mph into puddled/flooded sections of road. So even though it was still VERY hot & humid, I was drenched, and certainly didn’t feel like I needed any more water. I was wrong. Yep, this was in my head, for 90+ minutes of running. I jumped off my bike, heard that Pete was ~6:30 up, and thought, hey, if I put together a great run, and he bonks/folds for some reason, I still might have a shot. Then I put on my right shoe and was immediately greeted by my old friend, Crampy McCramperstein. Crampy kept me from finishing Texas this year, but I kept him at bay for my win at Wildflower, so I hoped I could ease into it and loosen up. First mile, smooth and relaxed, 5:50, no problems, whew. Two minutes later: Crampy ATTACK! Bam! Stop! No run for you! Crampy is eating my right hamstring. Stop that Crampy! I stopped, stretched, cursed, etc. Eventually I started jogging, each step getting the little micro-cramps. One mile later, boomshakalaka (negative style) – cramp, stop, walk, work back into a jog. I knew at this point my race wasn’t about catching Pete, it was about finishing. I had some awesomely awkward moments in there. I jogged through a big group of cheering rural farmers yelling “Go Ironman, Go Ironman, 2nd place, yeah!” Then I cramped, grab my leg and stopped…for like 2 minutes. They cheering continued for about a minute, but then slowly faded, until they just looked at me silently wondering what the hell I was doing. Awkward! I think one time I actually asked a group of Filipino farmers if they had some salt tablets. Ha! Oh man, I was in Jesse’s World. I did everything I could to get through that run. I imagined my 6 mile loop back home, “just the loop man, and you’re done.” Problem was this version of the loop took 70 MINUTES! I imagined running with Lauren, “just out for an easy run with Lauren, oh isn’t this special.” Everything in the book, but it was bad news. Of ALL the workouts, races, stupid challenges, dares, and BS I’ve put myself through in my entire life, finishing that race was hand’s down the hardest thing I’ve ever done. I cried. There, I said it. Mock me if you will! The reasons I finished: 1) I remained in 2nd place. Luckily, Cameron was chilling, thought I was way ahead, and didn’t see me until the last 200 meters. 2) The children. The cheering children lining the course. You gotta run man! 3) It was an out and back, so I had to get back anyway. 4) With about 3 miles to go, I walked by a random age grouper on his way out who yelled at me, “Jesse! If you don’t start running, I’m going to take away your Aviators!” I am not joking, that seriously happened. Awesome. Putting faces on other people's bodies is ALWAYS funny. The other guy is Pete by the way. Needless to say, I literally dragged my right leg across the finish line (last .2 mile ~13 min mile pace). I made it. I even did my best to smile. Definitely not what I was hoping for, but some good stuff in there. Probably my best bike ever. I rode too hard, but it was solid, and on a course that doesn’t suit my riding abilities. A decent swim too. And even with a DOOZY of a run/walk, I got 2nd place, and even beat a guy who’s super good (though had he known, he would have run me down). I learned a lot, and knowing is half the battle. How’s that for a short race recap! 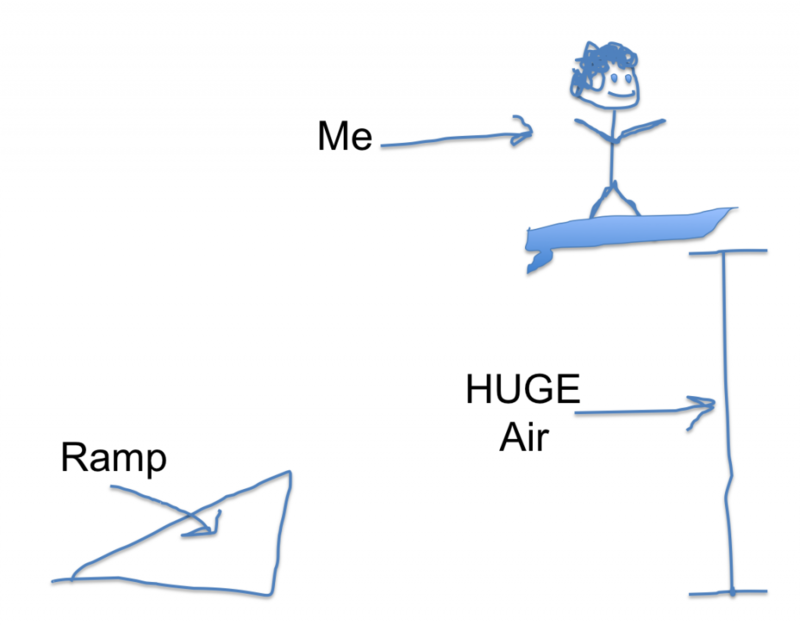 Graphical interpretation of my wakeboarding skills. On to more important things. You can imagine my excitement when after I crossed the finish line, the Governor came up to me and said “Great Job!…So when is the wakeboarding competition?” I didn’t say anything, just smiled, nodded my head, and threw up a little bit in my mouth. Oh my god, my pre-race smack down. I’m an idiot. But after a massage, an ice bath, a bunch of food and nap time, I wandered over to the cable park, hoping that the Governor had forgotten about my brazen idiocy. But sure enough, he was there, ready to go. So I took a deep breath, geared up, and yelled at my legs when I put them in the boots and they cramped, “You can fail me on the run, but I will not be denied some wakeboarding! It’s go time, legs!” I grabbed the handle, took off, and wooooosh, I was out there, and oh my god it was fun! I really love wakeboarding. It’s summer at the lake, lots of jumps and tricks, and when you’re behind a boat it’s like your own little Jesse Beiber stage, where the audience is forced to either watch you or jump into 25 mph speeding water. The adrenaline and fun masked the aches and pains of the day, I had a blast. The only bummer was cable park means no boat and no wake, which is the key ingredient to all of my AWESOME moves. So I did some surface spins and bunny hop 180’s and stuff, but those weren’t going to beat the Governor – who was seriously, really freaking good. So after a couple of laps I decided there was only one thing left to do – hit the launch ramp. I summoned all the courage left in my body, blocked out the little voice saying, “Your legs are going to break off!” and went straight into it. Before I knew it, I was airborne!…and upside down. So I landed on my head, but my imaginary fans love big crashes as much as they love big moves. It took me two more tries, but I did manage to land that launch ramp and by my own estimation caught a ridiculous amount of air! The Governor, however, was clearly a much better wakeboarder than me, so even though I took home my second 2nd place of the day, I won the respect of the three people watching me from the beach. No Billy Chrystal "White Man's Overbite", but the tongue is basically the same thing. The rest of the night was just as epic as the rest of the weekend. We had an amazing dinner/banquet/extravaganza with jumbotron video replays of the race, an incredible awards ceremony and a dancing group that was absolutely spectacular. It was first class the whole way. After the ceremony, the dancing group came out and invited the audience up on stage to do some limbo/break dancing/etc. 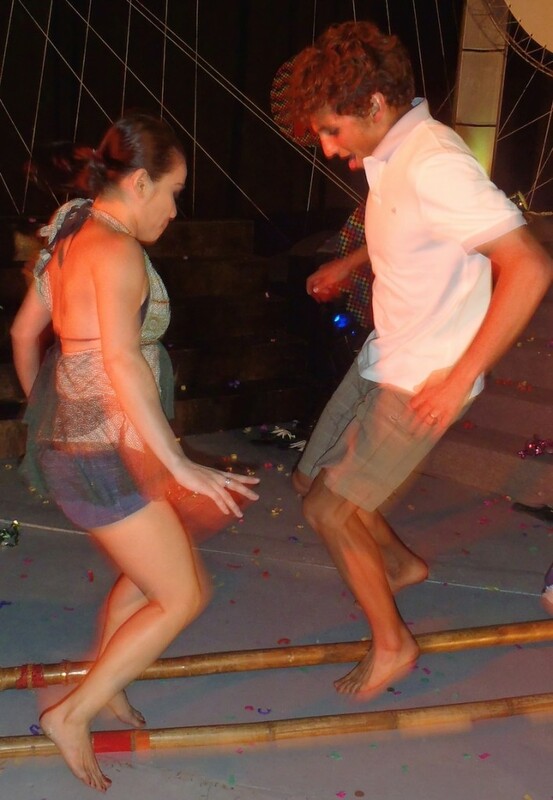 With a couple of drinks in my system and the last remnants of Jesse Beiber lurking in my brain, I cruised up there and went to town on some Tinikling, the National Dance of the Philippines. Tinikling is kind of like jump roping but with two small logs below your feet instead of ropes swinging around your head. As the music gets faster, you have to go faster to avoid getting your bare feet snapped off by a log clamp. Sounds like perfect recovery after a fully bonked half ironman, three monster crashes on the launch pad, and a few drinks right? Well, Jesse Beiber danced like his life depended on it, gave all the fans in his head a fitting finale, and ended the weekend on a high note. Super good times. Holy Crap! I asked Amanda Stevens if she had any clips of my Philippines adventures, and she came back with this video. Awesome! Thanks Amanda. Although the air I caught in my mind was much more impressive than in this video. Even though I’ve spent most of the last 3 weeks fighting a nasty bug, I’ve decided to stick my nose in the 70.3 World Championships in Las Vegas this Sunday. I’m doing this for two reasons 1) Experience. I hope to do very well at this race in the next 2-3 years, and getting a feel for the course, environment, and race dynamics is an opportunity I didn’t think I’d have this year. 2) It’s in Vegas, and it will be fun. Plus coach Matt says I’ll be ok. We’ll see. You can see what happens at Ironman Live at 6:30am on Sunday morning. Fred Uytengsu, CEO & Chairman of Alaska Milk Corporation, and Lrey Villafuerte, the Governor of Cam Sur. 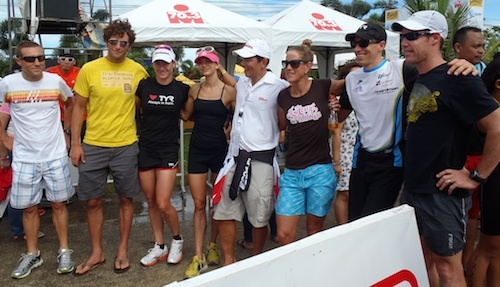 Fred and Lrey are responsible for bringing a 70.3 to the Philippines, and to Cam Sur in particular. Under their guidance and generosity, the race has grown each of its three years, created hundreds of jobs and enabled/inspired the pursuit of active lifestyles for many of the local residents. One young local resident even qualified for 70.3 Worlds and Kona! Amazing. I cannot thank you enough for the incredible hospitality and generosity you showed me and the other pros (and the 1500 age groupers) during our visit. It was absolutely remarkable. I am impressed and inspired by what you both have accomplished in business, sport, and in your communities. The race staff and volunteers – Princess, Ching, Farrah, Amanda, Monica, Guia, Guy, and anyone else I really hope I’m not forgetting. You guys made this trip so easy, and such a blast. I’ve never been pampered so much in my entire life! After I landed back in San Francisco, I found myself wandering around the airport, waiting for someone to come up to me, show me where to grab my bag, drive me home and cook me dinner! It was a shock to the system! It’s taken weeks to recover! Thank you so much, it was amazing. The residents/spectators of Cam Sur – By far the most I’ve ever been cheered on in any race. It was amazing, and honestly the reason I kept going. You guys were awesome and made the race atmosphere unlike any other! All the other pros & significant others, Pete & Jaimie, Cam, Justin & Belinda, Luke & Meg, Bree, Amanda, & Katya. This trip would not have been nearly as fun without an awesome group of people to hang out with. Thanks for the good times! Matt Dixon, my coach, and the inspiration behind Thrilla in Manila. Another positive step forward on the journey, lots of improvement on the bike. Sorry I embarrassed you with my run :). Gerry Rodrigues – As always, thanks for the help on the swin, getting more and more comfortable out there. Still a long ways to go, but it’s coming. Matt Lieto – Matt’s hookup is the reason I went to the Philippines. I missed the Man Van on this trip, but I appreciate the shout out dude! I am forever indebted to you. As always, my wife, my family, my support crew, Twitter, Facebook, & Newsletter peeps. You guys rock! Sorry it took me so long to post this race report, I hope it was worth the wait. Epic air dude! Haha been a little while since the whirly birds huh? Nice work. Bummer about your cramp. Way to pull the aviators in for some motivation though—and people say they’re just for show. Psh. Oh btw I’m in Eugene at the McMenamins on High St. See you soon duder! Worth the wait on the race report. Well done, and good luck in Vegas! Also, your jumping in and out of those sticks kind of reminded me of speed ladders back in the day. They should get rid of the ladders and get the sticks – way more fun. An answer from an expert! Thanks for cournibntitg. Wow, you got really high on that jump! You managed to make that run sound like it took longer than 1:32. It’s painful that it was still 4 minutes faster than my race where I paced it pretty well. I guess you make up a lot of ground on people when you run 5:30 miles between cramps, craps, vomits, bonks, and stops. Hah! So you are really cryin’ when i did that shot on the run? I knew you were sufferin’ though and at that point in time i really am admiring this “newcomer” pro that’s obviously havin’ a hard time but not quitting. Actually on the bike, i was halfway thru the first half and you were flying man. I thought you would catch Amanda and even Pete comes to run. 5 miles thru the run and i know that you are in deep trouble. Oh i wish there’d be more of those Triathlons on our place, then i could meet and support you in anyway i can. By the way… the local name of that bamboo dance is ‘TINIKLING’. Thanks Jesse for being a part of CamSur experience! Hello again Jesse. Say, can i share this to my friends in FB? Andre, definitely feel free to share with whoever you like. Thanks for the good lucks guys! Great job! As for this weekend you will do great, saw Bloom attempt the full last year, the course is suited for you just don’t get caught staring at the cool starting bridge thing. Jesse, the stick dance is called tinikling… National Dance of the Philippines. 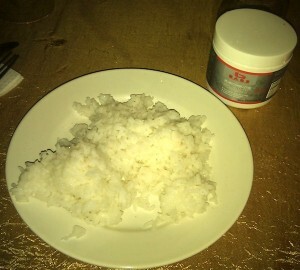 I remember doing it from time to time when we lived in Manila. Fun! Great race report. Sorry about the cramping. Um… please drink a lot of water in Las Vegas… and then drink some more. See you at the tailgate next week! Great job Jesse! Coming off the last couple weeks, and being a rookie we’re so proud of you! We’re so stoked for your next season! Jesse, your post are amazing. For the rest of the season, please do find some races in any sport just for the sake of writing 😀 Don’t let us without any post until next season. Dunno about 17th … but 4th fastest run? Isn’t that a huge huge hue win? Including #2? How long do you estimate you were in #2? Did you also get the fast #2? 😀 I hope to read all about it in your next report. It was great to meet you in Philippines. Fly Jesse, fly! Hey that’s my voice on the video! hahaha! Hello, Jesse. You have always inspired me in pursuing the sport. Got a few photos of you in Camsur 2011. Thanks. Chatbot agency to chat online, or current communication with each client. People work well when they have ongoing contact with representatives of a given company.